If you’ve got a skunk problem you’ll smell it before you see it! Skunks are nocturnal animals given their timid nature, so the likelihood of encountering one by day is rare. These varmints can actually be masters of pest control themselves at times, but they are also known to dig up front lawns of houses in order to get at one of their favourite foods: the chafer beetle. 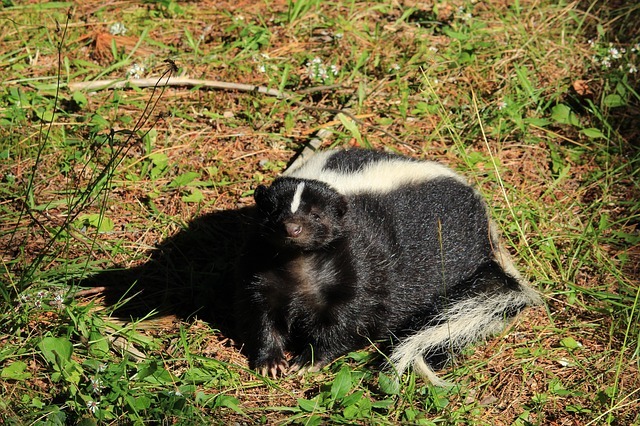 High season for skunks is actually in August in Vancouver and the Lower Mainland. However, this is the time of year when adults tend to become more active than they were in the winter, searching for food after living off of their fat stores for several months. Some of them may decide to make your yard their winter den! There are ways you can prevent a skunk from getting in your yard, but one thing that doesn’t get coverage so much is what not to do. Unless you like the idea of wearing “Eau de Skunk Toilette” for a while, getting too close to a skunk is not recommended. Granted, getting close may be unavoidable if, for example, you’re walking around outside in the middle of the night and stumble across a skunk in the dark by accident. Aside from that, if it’s broad daylight and the skunk is present, don’t get too close. Shouting at a skunk will only make it angrier or frightened. If it’s stamping and stomping its feet at you already, that’s how you know it’s feeling threatened. When its body forms in the shape of the letter U…that’s your cue to run, run as fast as you can away from it. That’s its big sign it will spray you. Unless you want to start calling your backyard “Le Skunk Chateau,” we suggest you refrain from attempting to bribe a skunk in order to get it to leave. Offering food to wildlife in general is a no-no; that not only goes for skunks but also raccoons, squirrels, and many other wildlife varmints we usually help folks get rid of. Your poor dog will bear the brunt of the skunk’s massive stink if you send it on a hunt for the skunk! Forget the tomato juice remedy you’ve seen online; that doesn’t work. The only cure for skunk spray on your dog is a bath. Give it a bath, rinse, and repeat. You could also try using this formula for washing: four cups of apple cider vinegar, a teaspoon of baking soda, and a touch of dish soap. Make sure you don’t get this in you or your pet’s eyes! Siccing your dog on the skunk will also make Fido resent you for the rest of his life. Seriously, leave your pooch out of this! Skunks are actually attracted to the same kibble your dog or cat likes to eat. If you see an empty bowl but your dog or cat hasn’t been outside all night, chances are you’ve got a skunk problem or other wildlife problem on your hands. It’s best that you feed your pets indoors, and lessen the risk of the skunk making its den too close for comfort. We’re kidding! Unless that skunk is Pepe Le Pew, of course. Walk away from the skunk, slowly and quietly. That’s about all you can do in the event you come across one in your yard. Sometimes calling in the pros is all you can really do without making too big of a stink. Call your local pest boss for help. We’ll get you, varmints! Creative Commons Attribution: Permission is granted to repost this article in its entirety with credit to Pest Boss and a clickable link back to this page. Vancouver, Burnaby, North Vancouver, West Vancouver, Richmond, and Coquitlam.